In the last part of this interview Edwin Vieira explained why the Federal Reserve System is unconstitutional. In this second part, he and Victor Sperandeo elaborate on its unaccountability and why it is ultimately harming the American people. Epoch Times: Mr. Vieira, apart from the fact that it’s unconstitutional, what other problems do you see with the way the Fed works? Edwin Vieira Jr.: You have a system in which a very small number of people—potentially just one, the chairman of the board of governors—can have tremendous say over all important economic variables: interest rates, the amount of currency that’s put out, the amount public debt that’s going to be assumed worldwide. This is because the Fed functions as a de facto world central bank. Epoch Times: And it’s an unelected official. Mr. Vieira: That’s right. These people when they were appointed—they were certainly not elected—have no responsibility to Congress; they come and tell Congress what they’re going to do. Congress doesn’t tell them what they should do, and they can’t be fired. I suppose they could be impeached. There’s some way to get rid of them but, technically-speaking, they’re in there for essentially as long as they are reappointed. Greenspan served almost 19 years. Epoch Times: So let’s go back to the system and see how it actually punishes taxpayers, workers, and savers. Mr. Vieira: The basic problem with the creation of currency out of nothing [credit creation by banks] is that somebody gets that currency initially. It might be the U.S. Treasury for whatever they’re going to spend it on—$100 toilet seats for the Army—whatever it is, or it might be some industrial concern, it might be somebody in the stock market. They spend that money when the price level is here. The bank is generating the money, giving it to the client; the client goes into the marketplace and buys goods and services, stocks, whatever. At this time, it is at a certain price level. Now that money circulates into the economy, and percolates down through the economy all sorts of transactions go on and the market wakes up and says “Wait a minute, there’s more money now.” Then prices start to change, going up in some instances, going down in some instances. The effect is that real wealth is transferred from somewhere downstream, the workers and savers who get the new money last, to these people who are the initial recipients of the newly created credit money. Epoch Times: So mostly the consumers and the savers are paying for the banks’ privilege to create money? Mr. Vieira: Somebody down there finds his cost of living going up faster than his wages; his real standard of living goes down. He’s had a real loss of wealth and that wealth is transferred up the line. If the government is the first recipient, you can call this hidden taxation. If private industry is doing it you could call it forced savings because those people in the market place are losing some amount of their real wealth and it’s going into the company to build up capital. Their problem is: They never get it back and neither do the taxpayers get it back. Victor Sperandeo: Let’s assume you had asked this question when Nixon went off the gold standard in August 1971, to take a period when there was no gold backing. If you take the consumer price index (CPI), from 1971 to March 2014, the compounded increase in the CPI is 4.26 percent a year, compounded. Now you show me a worker who can increase his wages 4.26 percent a year after taxes. That’s why there’s income inequality, that’s why the middle class is not getting anywhere. It’s inflation but you never hear a liberal or a conservative columnist ever bringing that point up. They blame income inequality on other things, like the CEOs are making too much money, etc. But they never bring up the Fed and inflation. 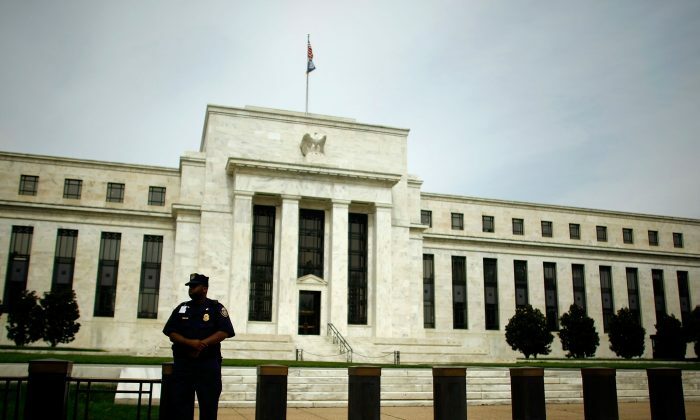 Epoch Times: Another factor is the interest on the public debt the U.S. taxpayer is liable for. Is it necessary for the government to borrow money for its expenditures? Mr. Sperandeo: Just as a point of order, in 1884 the Supreme Court ruled 8 to 1 that the government could print money for any reason, if it wanted to for emergencies. It comes from the Civil War. So, in effect, if the government wanted to, they could print money without the Federal Reserve; they would not need to borrow. The debt is there to give the Fed, the bankers, a partnership interest. They get 6 percent of the profits that the Fed creates and the government gets 94 percent, so they pay them a fee for running the system. It is basically complicating it so that the average person can’t see it. Plus, they want to get in big with the bankers who give donations and contributions for campaigns. Mr. Vieira: The real winners in this system are not those 12 regional Federal Reserve banks; they are dummies to a large extent. It’s all of the private member banks below the regional Fed banks that are using this pyramidal structure. They’re lending money out and collecting interest, and they don’t have to pay anything other than their tax rate. They don’t have to pay any of those monopoly returns over as a statutory matter to the U.S. Treasury. Epoch Times: Who owns this system? Mr. Sperandeo: They won’t give you the names by the way—it’s secret—and also the quantities owned. A lot of big bankers who own the regional Reserve banks, and therefore the system, are foreign bankers. I mean the Rothschild family definitely owns a piece of the U.S. Fed but it’s hidden, so are the Rockefellers and so are the Warburgs. So the key is, they do benefit to different degrees because they are getting 6 percent of whatever the Fed makes and that 6 percent, to my knowledge, is distributed equally to the ownership of who owns the shares of the regional Federal Reserve banks. Victor Sperandeo is a Trader Hall of Fame member and CEO of Alpha Financial Technologies LLC. He has written several best-selling books on trading and Wall Street such as “Trader Vic” I and II. Together with Edwin Vieira, he co-authored the 1500 page “Cra$hmaker,” a fictional book explaining the Federal Reserve System. This is Part 2 in the series with Edwin Vieira Jr. and Victor Sperandeo. Part 1 “Is the Fed Unconstitutional?” may be found here.